A new version of Typing of the Dead teaches players how to survive both a zombie outbreak and the job hunt. Typing of the Dead wasn't necessarily the kind of game you'd expect to be a hit. The very thought of playing a touch-typing game makes anybody that took a high school computer class twitch. Sega's 1999 release, which took the arcade shooter House of the Dead and replaced the guns with keyboards, turned out to be the sole exception to the rule. Its b-movie presentation, hilarious word selections, and the intensity of being attacked by zombies made for a fantastic experience and - although a sequel was released in Japan - a pretty sizable cult audience has been craving a sequel for years. A glimmer of hope is on the horizon, as Sega has announced that a new version of Typing of the Dead will hit Japanese stores tomorrow. There is a catch, however - we're not getting an entirely new Typing of the Dead game. Released in cooperation with the Japanese job placement site, Minna no Shuushoku Katsudou Nikki (Everybody's Job Diary), this is a resurrection of the very first Typing with new gameplay modes aimed at the unemployed. At this point, I imagine that you're completely mystified. How can a game where you slaughter zombies relate to the job hunt? I guess that becoming a zombie does open up a new job position, but the truth is a little bit more mundane. The ability to peck those keys as fast as possible will still impress your potential employers, and the new "Shukatsu" mode will drill important concepts related to the job hunting process into your mind while you improve your words-per-minute. Sega surveyed Everybody's Job Diary members and collected 3000 words related to employment, interviews, and the job search. These words and phrases are used to fight off zombies in four different minigames. 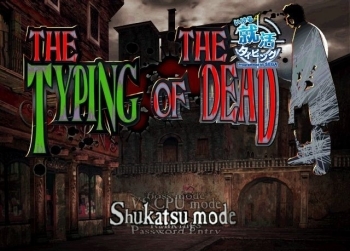 This new version of Typing of the Dead will be released for Japanese PCs tomorrow for Â¥2,300. As far as I can tell, this release contains all of the original modes in addition to the new employment-related content. If you don't actually own a copy of the game yet, this may be a cheap way to give it a try. Who knows? If this program is a success, Sega may finally develop that Typing of the Dead Overkill that I've been fantasizing about.